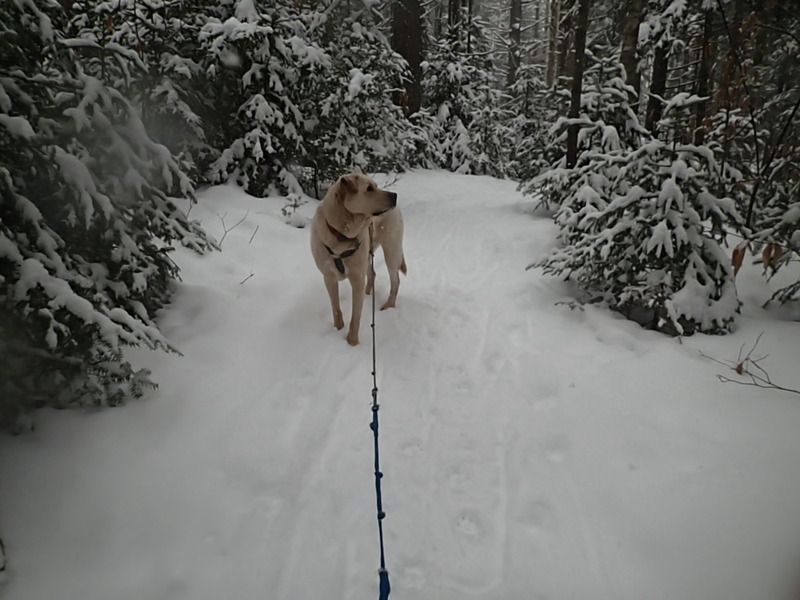 winter | Vermont Paddle Pups! Just a short post this week….yes, the title is in Russian. I do not obsess over the Olympics, but do enjoy watching the sports of ski-jumping, hockey, speed skating, and some Nordic events. I personally have known some Olympians, and in this crop of athletes is a girl I had in my Brownie troop…have to root for her! We actually had some snow arrive this week, in the form of 10 inches of light and fluffy stuff. Temps remained cool, but had moderated enough to permit some snowshoeing, skijøring and kicksledjøring this week. Tried out a new XC center…cold, but a beautiful day. his centre has one long loop ( 3 trails) on which dogs are permitted. No grooming for skate skiing, only the classical track, bordered by loose, soft, snow. We usually engage in classical style, but on the wider skating tracks. 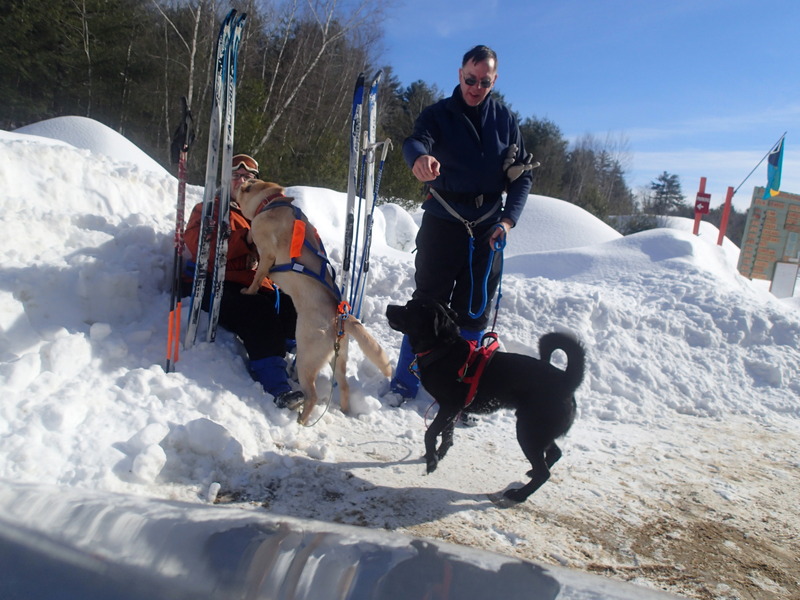 That way we don’t get reprimanded for having our dogs run in the ski tracks, and we have an easier time negotiating some downhills (in other words, easier to snowplow!) But we managed nicely, and had no memorable falls, to document on “wipe-out Wednesday”. So, I am a small-scale blogger….but having a great deal of fun giving it a whirl! Connections I have made with other bloggers,K9 folks, and outdoors lovers has been one of the unexpected consequences of this endeavor. Here is my contribution to the GoPetFriendly.com Blogger Challenge of 2014! I started the blog in March of 2013; my clever daughter has a wonderful blog about her weaving exploits, and she said that even a computer-dunce such as I am, could develop a good blog. 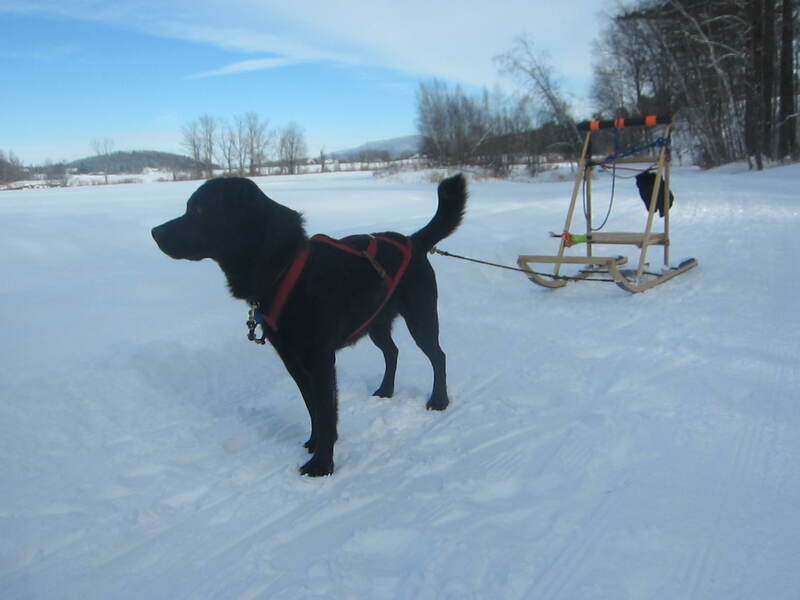 The blog was great fun to write, and when canoeing season ended, my family encouraged me to expand it, to include our skijor, kicksled, and snowshoe activities. I essentially taught myself, and learned as I went along…I am not inherently technologically gifted, so being able to write, illustrate, and maintain my blog was a feat for me. I have had a great time writing; unexpectedly, the more entries I wrote, the more fun the blog became.…recognizing that your narratives can allow for creativity and fun. 4. What lessons have you learned this year – from other blogs, or through your own experience – that could help us all with our own sites? I would say “ Less is More”….long rambling narratives are not usually necessary—short, concise, informative and entertaining write-ups are more readable. I also learned about blogging networks…such as the Outdoor Bloggers Network. If you could ask the pet blogging community for help with one challenge you’re having with your blog, what would it be? Deciding on frequency of posts? I tried for one post per week in canoe season, and aim for 2 per month in the winter…too much? Not enough? I had originally intended to end the blog at conclusion of paddling season…then I could not decide of I should start a new Winter Adventures blog, or just amend the existing one…I don’t think I did a good job on the transition to the new area of focus. Facebook links, and Outdoor Blogger Network. I have not really pursued an increase in traffic. I don’t really publicize it much…it was designed for family and friends initially, and I am only gradually expanding beyond that. 7. How do you gauge whether or not what you’re writing is appealing to your audience? How do you know when it’s time to let go of a feature or theme that you’ve been writing about for a while? Hmmm..if it bores me, it certainly bores others. I trust my “family editor”to let me know. If I agree with the post, I am more likely to comment….generally, I do not follow blogs that are not reflective of our interests, and usually our philosphies. Maybe product reviews? Not in this for commercial or financial gain, but might be fun to do this. Not sure how to go about it. Go for a hike, paddle, swim, ski, etc….I usually will not start to write until I have a specific idea in mind..and photos to go along with it! A week weeks off or so, not really planning on doing blog in the winter, but picked it up again after a few weeks. It’s fun to write the blog, and my small circle of target audience seems to enjoy it.